Turquoise rounds and silver earrings, matched with silver add a cool fresh look to a far out design with influences of the far east and ancient times. 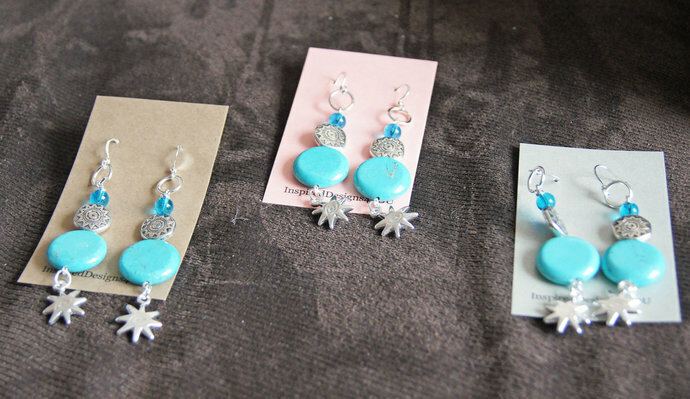 Turquoise and silver are nicely balanced. Finished with the all knowing Eye of Horus at the base. The blue beads at the top add a delicate allure. Suspended on french nickel free ear wires. Artistic flair reaches new dimensions in this outer world. This was a fun piece to create just for you! Measures: 2 1/2 inches from top to base. Nickel free and hypo-allergenic for complete comfort. Items are ready for shipping and packaged in a strong presentation box, and bubble mailer to ensure safe delivery. If you have any questions please call out we are here to help at any time. Any overages with be gladly refunded for postage. Ear closures: Shepherd's hook, lever back or clip on. Please make your selection.